Once you've integrated with Gmail by adding the Google integration in Settings, you'll notice the following email features that make organizing client communication so much better. Using Gmail as your email provider in Táve means that we can track an entire conversation through unique message IDs. With this information, we're able to automatically pull in any replies to and from the client for the entire thread of the conversation. Visually, we will group those messages as part of a thread in both the email list as well as the mail viewer on the job. Notice the (2) next to the message indicating there are 2 messages in the thread. When looking at the message itself, you'll see the full thread and be able to collapse and expand individual messages. This is really where all of the magic is. As mentioned above, replies from your clients are automatically imported back into Táve and included with the original message in the thread. This is because we recognize the message ID and/or thread ID in the meta data of those messages. But what about the emails from your clients that didn't start in Táve? Or someone emails you randomly and you want to get that email logged in Táve? 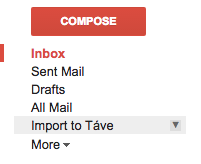 When you first connect your Gmail account, we create a new label in gmail called 'Import to Táve'. You can rename this to whatever you'd like after it's created. If you have a message you'd like to import, simply apply that specific label in Gmail and it'll get imported (Sidenote: if the message is marked as unread when you apply the label, it will appear as unread in Táve and vice versa). Not only will that message be imported into Táve, but any following messages to or from the client will import as well. Most of the time, however, you won't need to use the 'Import to Táve' label. In addition to auto-importing messages where we recognize the message or thread ID or where you manually add the 'Import to Táve' label, we'll also auto-import messages from known contacts. Known contacts are contacts that exist in your Táve address book. 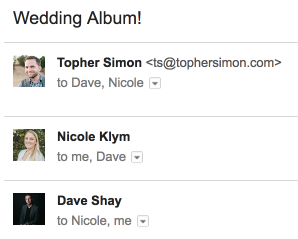 A good scenario is one where your bride shoots you off an email to ask a quick question. This message wasn't in response to an email you sent from Táve, but since we know who the message is from (bride's email is in your Táve address book), it gets imported to Táve because it's from a known contact. Not only do we import it, it also gets automatically attached to her latest job in Táve. There are some pretty magic rules determining what gets automatically imported and what doesn't so we've created this nice diagram to help you understand. Click on the image below to view full diagram! When using Gmail as your email provider in Táve, all recipients of a specific message are included in the message thread. That means that everyone in the To: field will see each other throughout the thread. If you're used to how Táve handled emails sent to multiple recipients before, this will be a little bit different. If you're not using Gmail as your email provider and instead using the built-in Táve method, each recipient would get a copy of the email but it would be as if they were BCC'ed and would not see the other recipients in the message header. This is a simple one but essential to keeping you organized. With the Gmail integration, messages marked as read in one place will update as read in the other. For example, if you're in Táve and a new message comes in and you read it there, it will get marked as read in Gmail as well. Magic.